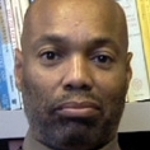 Home » People » Emeritus Faculty » Leroy Davis Jr.
Leroy Davis, Associate Professor Emeritus, (B.A., Howard University, 1976; M.A., 1978; Ph.D., Kent State University, 1990); 20th Century African American and American history, 20th Century African Diaspora. Co-author, African Experience in Community Development: The Continuing Struggle in Africa and the Americas, Vols. I, II; author of A Clashing of the Soul: John Hope and the Dilemma of African American Leadership and Black Education in the Early 20th Century(1998). I am especially interested in cross-cultural experiences of people of African descent throughout the African Diaspora. My present project is the life history or biography of Mariamne Samad, an 80 year-old black cultural nationalist born into the Garvey Movement (both of her parents were Garveyites) in Harlem, New York. In addition to Harlem in the U.S., her life experiences include family connections to Sierra Leone in West Africa, Georgetown, Guyana, in South America, and Kingston, Jamaica (where she still resides) in the Caribbean. I am very interested in immigrant and emigrant identities as they adjust to racial realities in different geographical spaces, and how issues of intraracial class, color, and gender factor into interactions between nationals and expatriates in various African and African Diaspora societies. PhD, Kent State University, 1988.